Learn to transform difficult emotions into catalysts for wholeness and well-being. >You're late to a meeting and caught in traffic. Your toddler is screaming and your in-laws just showed up. You're about to give an important presentation but you've misplaced your notes—and you're beginning to panic. We all find ourselves in situations that stir up anxiety. And for many of us, our fear and worry have reached debilitating levels. How can we stay balanced and live up to our potential when fear and anxiety seem so easily to get the best of us? According to Dr. Friedemann Schaub, the answer lies in the subconscious mind—the source of our most challenging emotions and the key to the wisdom they offer. “The more unresolved fear and anxiety you've stored in your subconscious, the more untapped potential awaits you,” explains Dr. Schaub. With The Fear and Anxiety Solution, now you have the tools to change faster and perform better in every aspect of your life through the power of conscious-subconscious collaboration. 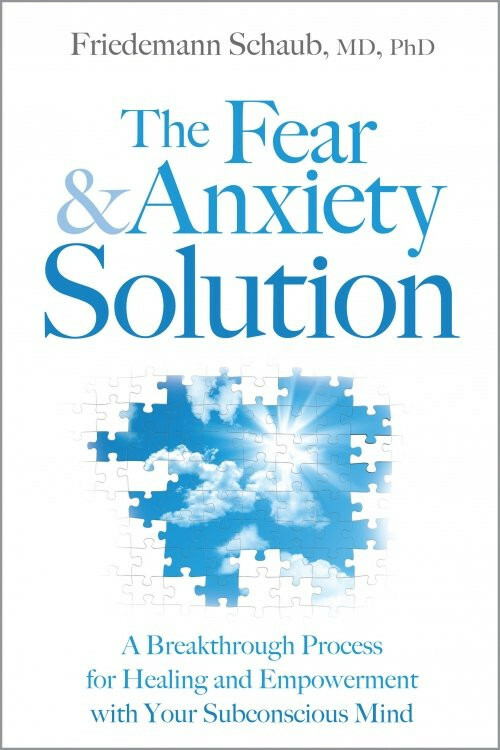 The Fear and Anxiety Solution is the 2012 Independent Publisher Award Gold Medal Winner and the USA Best-Book Award Winner in the category best new-self-help book. “The Fear and Anxiety Solution is beautifully written and loaded with the truth that can free you from the adverse effects of fear and anxiety. I highly recommend this book!" You are not your weakness, you are not your anxiety, you are not your fear…You are Peace …You are Joy …this is not philosophy but this is what I have learnt from Dr. Friedemann’s book and guided meditations. When you identify yourself in this way (Peace-Strength-Confidence…) (Dr. Friedemann will teach you how you can easily get there),your life will change and you will be surprised of the many gifts life will offer you but you were not able to see it through your negative filter . In this book, you will learn how to release negative past experiences from your memory and from your body that take all of your energy, you will have compassion to your inner saboteur or inner critic because you will understand his purpose and you will know how you can make your positive voice work with your negative side in order to be whole again and when you are whole, there won’t be any more inner conflict that keeps you stuck and depressed. You will have a new empowered image. The most important t thing to understand is that negative emotions are not here to bother us but they are just messages from the subconscious that we need to accept and acknowledge and not to fix but to learn and grow from them. Exellent resourse for my continued work on my sub-conscious and resolving issues. Along with paying attention to my dreams and Metta meditations, it gave my insights into a path for growing.